Every statement that a person makes is either true or falsethat is, a lie. 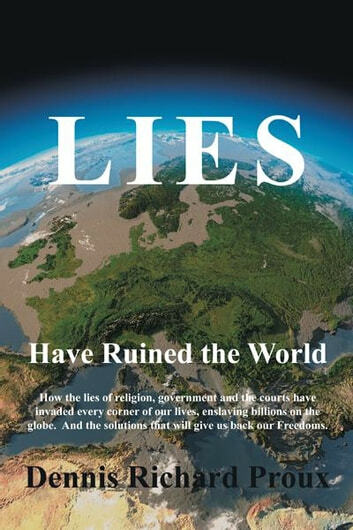 In his comprehensive study, Lies Have Ruined the World, author Dennis Proux seeks to expose the dishonesty, myths, and fabrications provided by powerful influences in the most important areas of our lives, including religious institutions, government, and our legal system. Proux feels that all humans yearn to be free to discover their own worlds and realize their full potential. While relying on the wisdom and insight from such authors as Charles Darwin, Thomas Paine, Carl Sagan, and countless others, Proux offers a compelling glimpse into the lies surrounding western monotheistic religions, Wall Street, and our nations government and justice system. As he examines biblical tales, reveals corruption within our society, and dissects many painful realities, Proux offers insight and potential solutions that will ultimately inspire a life based on fact and honesty, rather than on fiction and lies. Lies Have Ruined the World encourages seekers of the truth to explore their own perceptions of the failure of western institutions to garner and hold trust.